I, like @Nicole cannot STAND tap water, Aquafina or Dasani. Lemon doesn’t help nor do oranges. In fact my taste buds can barely tolerate any water but I force myself to drink bottled alkaline water. My favorite brand is Essentia. Britta filtered water tasted very gritty to me. Thankfully my daughters and hubby like the water filtered via our refrigerator. To reduce my carbon footprint I buy Essentia in bulk in the largest quantity available. I haven’t tried alkaline drops in tap water but after considering this post maybe I’ll try it. Does anyone have any experience with it or anything else portable to address the taste for those of us who genuinely do not like the taste of water? Has there ever been a study to show that bottled water companies are adding a “dryer”(for lack of better words) to their water to make the drinkers mouth dry??? I remember drinking water as a kid and being able to fill up on it and have a healthy water burp but since the bottle water craze I constantly find my mouth and throat dry while in process of drinking it. Doesn’t matter how much I intake or what brand (although I will say that the taste of Nestle water was unbearable when I was pregnant). I get the feeling that just as with the cigarette industry adds more addictives to keep consumers, bottled water comps are following the same steps except it has me running to tap water. Thanks for this blog and I will definitely take a look at the tap filter link above. I don’t know, mama. It could simply be that you need more water as your body grows in size. The same amount of water that quenches your thirst as a kid isn’t the same amount that’ll get it done as an adult, you know? And, while water companies definitely are out there adding weird stuff to the water that makes it taste differently from brand to brand, I don’t think it’s enough to act as a “drying agent,” to be honest. I finally bought a water filter for the sink and the taste of water is great and leaves me feeling like a kid again water burps and all, lol. But you definitely made a solid point on water intake. I haven’t always drank 4bottles(8-8ounce cups) a day but even on days I did it still didn’t compare to water from the sink as a kid nor does it from my sink water filter as an adult. Thanks for writing this article and helping me to reclaim the (water)fountain from youth. I keep my tap water in a Thermos stainless steel water bottle that keeps the water cold and doesn’t sweat or leak. Holds 3 cups of water, too. It’s not hard to find things nowadays with the Internet. Stop making excuses, people! I loved this article and I think you do a wonderful job in pointing out the marketing that has been done to sell bottled water. I remember how it really started to hit people in the 80’s. The majority of people acknowledged it as stupid. I, begrudgingly, admit to hitting up convenience stores as well. But I know it is for no other purpose than to quiet the pervasive advertisement that I have allowed to seep in. So, I’ll just take it one day at a time with my Brita filtered water bottle (9.99 @ Target) and slowly watch the savings reaffirm my decision. Thank again, Erika! If not for anything else, giving up bottled water shows that we actually care something of our our already polluted environment. Where so we think all those bottles end up? 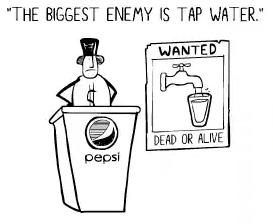 I stopped buying bottled water about 3 years ago; I felt like I was doing more harm to the environment than good. I find it interesting that of all things, we still defend poor health and environmental habits at any cost. I never appreciated American tap water before I moved to China, where it’s not potable. At all. I miss my Brita pitcher but that would not get the job done here.